A few days ago the Phoenix Mars Lander successfully reached Mars. Its mission will be to search for ice water at the Martian Arctic. Already there are indications that it will be successful. The availability of water on Mars will boost both the search for Martian life and the practicality of human exploration. A human Mars mission faces enormous challenges such a radiation and the long trip in micro-gravity. We not only have to get the astronauts there but we need to bring them back. But do we really need to bring them back to Earth? Why not send them one way, to stay? 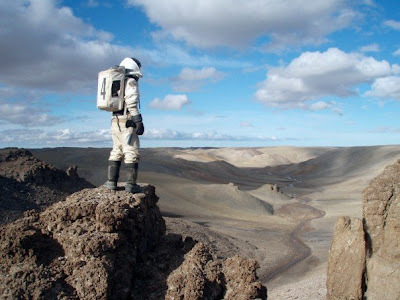 If the end goal is human colonization then sooner or later humans will go to Mars to stay. Thats what colonist do. The question really is are we at the stage yet when permanently homesteading Mars is realistic? The European settlement of Australasia and the Americas was preceded by human explorers. No human has visited Mars but space agencies have been sending robotic pathfinders for decades. Perhaps we can skip the human explorer stage and go straight to colonization. This is not a new idea, George William Herbert laid out a possible architecture several years ago. The basic requirements are shelter, water, air and food. The colonist can take shelter with them, inflatables can be roomy and comfortable, covered with Martian regolith they would be protected against radiation. Water can be condensed from the atmosphere's moisture or better still extracted from ice or the soil if available. Oxygen can be obtained from the water or atmospheric CO2. Enough dehydrated food for several decades would be sent and it would be supplemented by fruit and vegetables grown in a greenhouse. "Here is an ‘out of the box idea’," Ruth writes. "Let the heroes of ‘All’ our countries, for once, risk the ultimate sacrifice for something greater than one man’s idea. Maybe once let these men and woman that rise every morning and say ‘today I will stand for something’ and say ‘evil will not prevail, not on my watch’. For once let them volunteer for us all, you never know, mankind, the human race. It might just catch on if we let it." Ruth continues, "Will we falter at a hint of death or danger? Or will we do now what so many in ‘ALL’ of the world’s history has done before us. NASA of all thinking societies should understand this. Would there even be an America or NASA if a man named Columbus had not pursued a dangerous and possibly deadly voyage to a new world? He certainly had to consider whether or not he would ever return home to see all those he loved so dearly. But what of those aboard his ships, those that left Spain knowing that they would never return. Those few that willingly risked all for the chance at a new world and a new future, could they have possibly known what effects they would have had on the future due to their sacrifices? Now can we have enough vision to see our destiny, can we, for a moment, see past our petty differences of race and religion to see…peace, prosperity and possibly a new world." 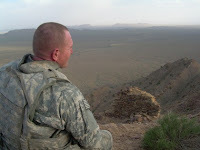 SFC Ruth is a man of courage and vision. NASA wanted to send a professional to Mars but to save money it would be a one person one-way mission. They first asked an astronomer who said , yes he would go, it would be the fulfillment of his life's work. He would do it for one million dollars which he would give to his family. A medical doctor was then asked. He said yes, he would go for two million dollars, one million for his family the other million he would donate to medical research.